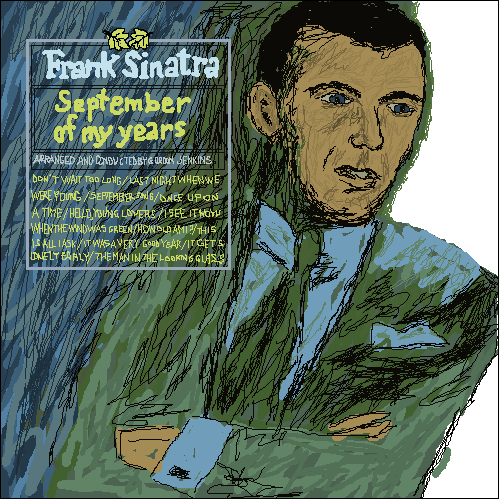 This week’s album is “September of My Years” by Frank Sinatra, released in April, 1965. Now there is no way we could do this project without having ol’ blue eyes in there somewhere. Sinatra started out with a successful career in the early 40s during the swing era. After a bit of a career slump in the 50s, it was his acting career that bought him back into the limelight winning an Academy Award for Best Supporting Actor in 1953. This gave Sinatra the exposure he needed to reboot his music career and he went on to release some of the most acclaimed albums of his career. But it wasn’t just his music and acting that he was known for. Alongside Dean Martin, Sammy Davis Jr, Peter Lawford, and Joey Bishop, Sinatra formed what was known as ‘The Rat Pack’, a group of actors that were the epitome of cool in the 60s. All of the men wanted to be them and the women wanted to be with them. By the time 1965 came around Sinatra was over 20 years into his career and had just turned 50. “September of My Years” is a significant album for him. Not only did it chart well, it is considered to be one of his greatest. The whole thing is written from the point of view from a man approaching middle age and looking back at the life he’s had. The problem with that is that it makes for quite a boring subject matter. Which is surprising considering the life Sinatra had lead by this point… the FBI don’t put you under surveillance for 50 years for no reason. Frankie was a bad boy, but the album shows none of this in the lyrics. Musically the album is absolutely glorious and lush, if you are into orchestral music. The problem with it for me is that it’s way too run of the mill. Every song is the same subject matter, musically the same as the last. There is no variation in the tempo and even his intonation of the lyrics are lacklustre. And let’s be honest, the only reason any of us like ‘It Was a Very Good Year’ is because of Homer Simpson. Before I took up a career in coffee, I was a massage therapist. Every massage therapist knows you never play music with a tempo faster than a heat beat. You play a nice slow song with a steady beat to lull the person into a nice relaxed state. Well that theory worked for me with this album. I fell asleep listening to it… twice. I wish that was a joke but I’m afraid it’s actually true. As much as I tried there was nothing I liked about it. I felt like I should have been listening to it in a nursing home whilst my old grandpa reminisced about the good old days. Sinatra was only 50 when he recorded this, still a long way to go before the nursing home. I could break the songs down one by one but I don’t really see the point as every song was pretty much the same. So instead I’ll give you one synopsis and you can apply it to each track: I am getting old. Oh what a great life I had as a young lad. Girls. Fun times. I’m a little bit lonely. Metaphors about the seasons. But oh now I’m old. Old. Old I tell ya. Yes, Frank Sinatra is an amazing singer. Yes, he is a major influence to many musicians. Yes, he is worthy of all of the acclaim. But I can only call it as I see it kids and this album over produced and underwhelming. It’s a bit of tricky one, having an artist represented on afyccim with just one album when they have a career spanning 50 years. Whilst this album is considered one of Sinatra best efforts, we can’t judge the man on it alone. And those who loved him through his whole career can see how he got to the place where “September of My Years” was made. Unfortunately, I don’t have that insight as other than the usual crooner style songs we all know, I know nothing of Sinatra. What I’m trying to say is I feel a bit bad for writing the man off, but as much as I tried I just couldn’t appreciate this. I can appreciate the man is talented and I can appreciate why this album is so highly regarded. I’m just glad I won’t have to listen to it again. Note: I make no apologies for the fact the cover looks more like Don Draper than Frank Sinatra. Well, wasn’t that an awesome experience. I can honestly say that I did not enjoy listening to Frank Sinatra’s “September Of My Years” one tiny little bit. Which is a bit sad, because Frank Sinatra is considered to be one of the greatest singers of all time. I guess maybe a lot of his acclaim came from his time in the Rat Pack, but that included film and stage work. If, for some reason, you are reading this review before actually listening to the album, let me give you some valuable advice: Listen to the first track, then give up. There’s no need to go any further. Every single song is exactly the same. EVERY. SINGLE. SONG. Dude, we get it. You’re not the young player you used to be. I’m sure it’s very depressing. It must be, because you wrote (and subsequently forced me to listen to) thirteen songs all about it. The arrangements were lovely for the first track, and probably would’ve continued being lovely if I didn’t have a feeling of deja vu with every following track. The strings are exactly melancholy enough to fit with Sinatra’s theme of near death. There is an awful lot of thematic imagery running through the album. Colours, months and seasons feature heavily. “One day you turn around and it’s summer, next day you turn around and it’s fall. And the springs and the winters of a lifetime, whatever happened to them all?” It pretty much continues in that vein. There’s no doubting Sinatra’s voice though. Absolutely immaculate, the man was born to croon. But he wasn’t limited to it. You only have to listen to ‘The Lady Is a Tramp’ to see how he can pick the tempo way up. It’s a shame there wasn’t any of it here. Frank Sinatra has one of the most intoxicating voices I have ever heard. Within 1 minute of listening to Track 1, ‘The September of My Years’, I was captivated. My heart ‘pinged’ a little within the opening bars of “September of My Years” and I was transported to New York on a cool autumn’s day, the leaves falling off the trees in Central Park, as Sinatra vividly recalled seasons past. There were moments where I stopped and closed my eyes and soaked up the velvety tones of Sinatra’s vocal, I know it sounds corny, but I’m a corny kind of person. This album is O.T.T in an instrumental sense; Sinatra is accompanied by a full orchestra complete with strings and woodwind section. The album plays like a dramatic Hollywood film score, but has a vulnerability and wistfulness to it. Intentional or not, in essence “September of My Years” was a concept album, hence the retrospective theme and the constant comparisons of love and life to the four seasons, and particularly centering on fall/autumn and how it pertained a period in one’s life. ‘It Was a Very Good Year’ is a lovely recollection of teenage memories, although the serious themes of the track were tainted by my recollection of a certain Simpson’s episode featuring a satirical re-make, aptly titled ‘It Was a Very Good Beer’. This is proof that Sinatra’s work still carries through to popular culture today. “September of My Years” was more than enjoyable to listen to, it’s an enchanting collection of well-chosen songs that together, tell a wonderful story. After my first listen, I sat in silence and just kind of reflected back on the album; it took me a while to come back down to earth. I honestly think I fell head over heels in love with Frank Sinatra, and I may take a while to recover. Frank Sinatra had just turned fifty when he recorded this album, which finds him in a state of reflection. Almost every song here eulogises lost youth or reminisces moments of time gone by, which seems a bit premature for a fifty year old. It was a different time, I guess. Sinatra released over thirty albums in the 1960’s and this one is widely considered his finest work of the decade. Winning Grammy awards for Album of the Year, Best Vocal Performance (Male) and Best Instrumental Arrangement, it certainly sounds wonderful. Sinatra is in top form and his voice flows through the music like scotch whiskey over ice. The orchestration is magic, drenching the songs in melancholic nostalgia. It’s a bit like complimenting a boring movie’s cinematography I guess, because most of the album failed to hold my interest. All the albums tracks are fairly slow and sound very similar. It would be perfect background music when you’re visiting your grandparents. I did, however, enjoy ‘Don’t Wait Too Long’, ‘Hello, Young Lovers’, ‘This Is All I Ask’ and, of course, the album’s centerpiece ‘It Was a Very Good Year’. Like many people, my first exposure to that song was Homer singing about drinking some very good beer when he was seventeen. I now hold it as one of my favourite songs of all time. It never fails to give me goosebumps and Gordon Jenkin’s arrangement is just breathtaking. That song is possibly the strongest case for this record being on the list. If you’re a Sinatra nut, you’ll probably love this. I’m a casual fan, and I tend to like his snappier tunes. I’d choose his “Songs for Swinging’ Lovers” album over this, but that’s from a different decade.